In this new era, Skype is no longer an application that is only used to connect with the overseas friend. This online communication tool is now bringing a new experience through the introduction of the best call recorder for Skype for Windows. 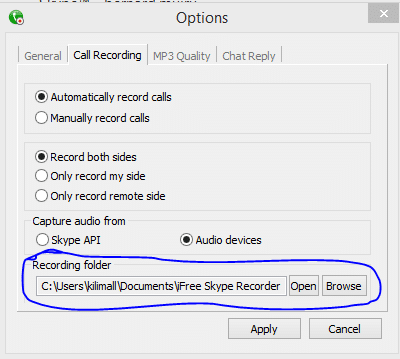 With a Call Recorder, you can record your Skype conversions in audio and video formats. If you have not been recording your Skype calls you can now enjoy the services of iFree Skype Recorder, which has impressive features. Apart from TalkHelper software, this application gives the best you can expect as far as Skype recording is concerned. It is the right time to install a Skype Call Recorder for quality Skype conversations for future references. You have every good reason to use iFree Skype Recorder. The app is the first one in the world for recording Skype calls without any limits to the users. You can record without incurring extra cost, which is quite interesting to the users. The app has both capabilities like manual and automatic recording. The automatic feature is helpful for Skype conference, and different companies can use this application when carrying out interviews with their clients. 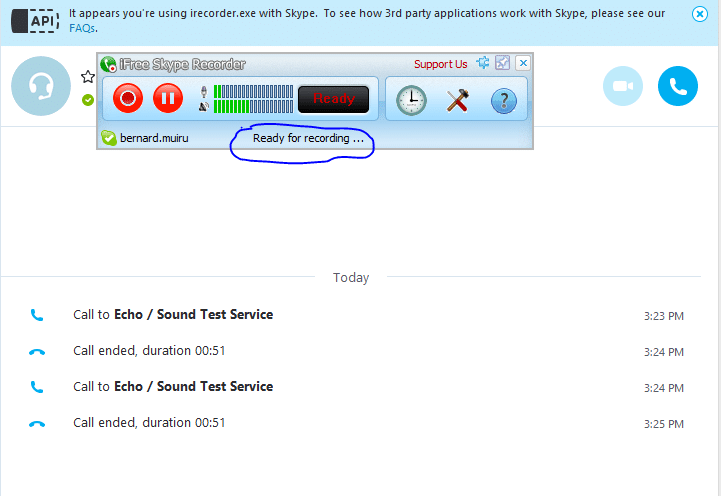 After a successful download and installation, iFree Skype Recorder will now be “ready for recording”. The left red button is the “Start” button and the right one is the “Pause” button. If you don’t need to capture some parts, you can just click the “Pause” button as you continue with your conversation. You can later resume recording with the “Start” button. You can as well choose the type of the recording you want by clicking Options-Call recording. You can select either record both sides, only record my side, or only record remote side. Click “Apply” and move on. Choose the type of MP3 Sound Quality you would like to record with. You can do this by clicking Options-MP3 Quality-Recording mode. 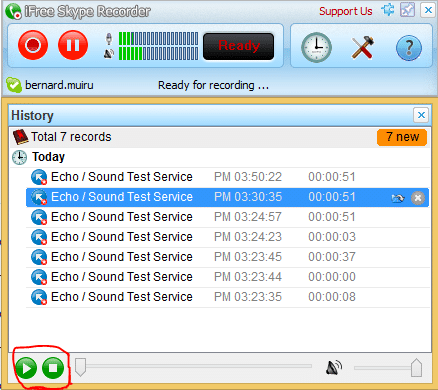 iFree Skype recorder comes with different sound modes like Mono, Stereo, and Joint Stereo. Also you can choose options like Recording BitRate and Recording SampleRate for the best recording quality. If you wish to replay your recordings, you can go to history and select any of your recordings. There is a play/stop buttons below. You can choose where to save your recording by moving to Options-Call recording-Recording folder-Browse. Your recordings are useful for post-production and future reference. In order to use this tool effectively, few settings need to be set. There are times that you will be away but still need to reply to some important chats. iFree Skype Recorder is a nice tool since it enables you answer some chats and calls on your behalf. 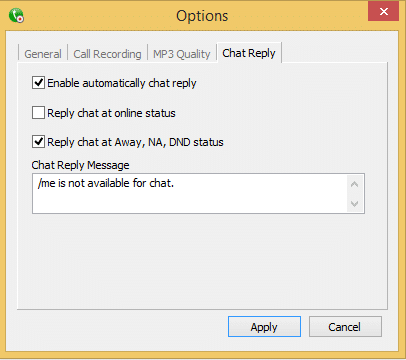 This software gives you three options namely, enable automatically chat reply, reply chats at online status, and reply chats at Away, NA, DND status. You can type a short text on the text-box that you wish can be sent to your caller. After clicking “Apply”, that text is ready for dispatch in case of a call or a text. iFree Skype Recording software can record automatically or manually according to your specification. To achieve this, you can just move to Options-Call Recording. Here, you can choose which mode you wish to set your tool. The above are some of the things you need to configure for smooth operation of this tool. The tool is easy to use if you follow the above. iFree Skype Recorder replies chats automatically if you happen to be away from your computer. The application gives you options on which mode to record your calls. It is a free application without limitations whatsoever. With iFree Skype Recorder, it is easy to track history recordings from specified locations. Everything is sort by the size, date and time. The interface of the iFree Skype Recorder application is very straightforward to use to all users. 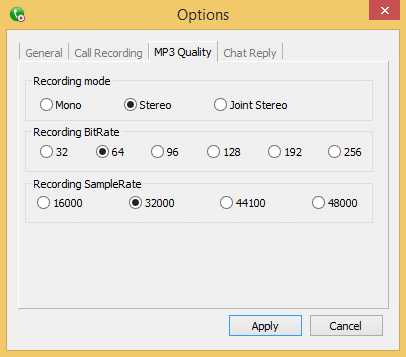 iFree Skype Recorder store the recordings in an MP3 format. This means that you are free to play your recordings with any external devices. The application has no control over audio and quality video. Some recordings may end up being unclear and audible. 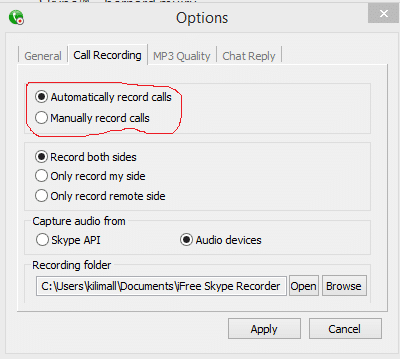 iFree Skype Recorder does not give out notifications during Skype calls recording. Recording audio and video calls on both sides is not easy. It is hard to record video and audio at the same time. This application is not fit for commercial users due to numerous limitations. The software records very short audios hence not good for more complex recordings. To get the premium software it will cost you much. With this software, you can record your Skype audio and Video Conversations, and then store them for future reference. Unlike TalkHelper software, the app does not have control over the quality to be recorded. iFree Skype Recorder is a nice application in the market, and you can install it on your device without charges. The app is lightweight and needs low processor requirements to avoiding hiccups on your devices. You need to try this Skype Recorder and record your conversations.